The American Seamen’s Friend Society was established in the 1820s and incorporated in 1833 “to improve the social and moral condition of seamen.” Growing out of the same religious revival that promoted temperance and the abolition of slavery, the society sought to uplift sailors by giving them an alternative to the bars, boardinghouses, and brothels that they commonly frequented while in port. The society established well-managed and reputable sailors’ boardinghouses, including one for African Americans in New York. It encouraged sailors to save their earnings, which resulted in the founding of the Seamen’s Bank for Savings. On shore, the society provided access to religious services, lectures, and reading rooms. It was perhaps best known for the libraries of books that it placed aboard American ships for the use of sailors. Between 1859 and 1930 it sent out more than 13,000 of these seagoing libraries, each containing 40 books in a wooden case. 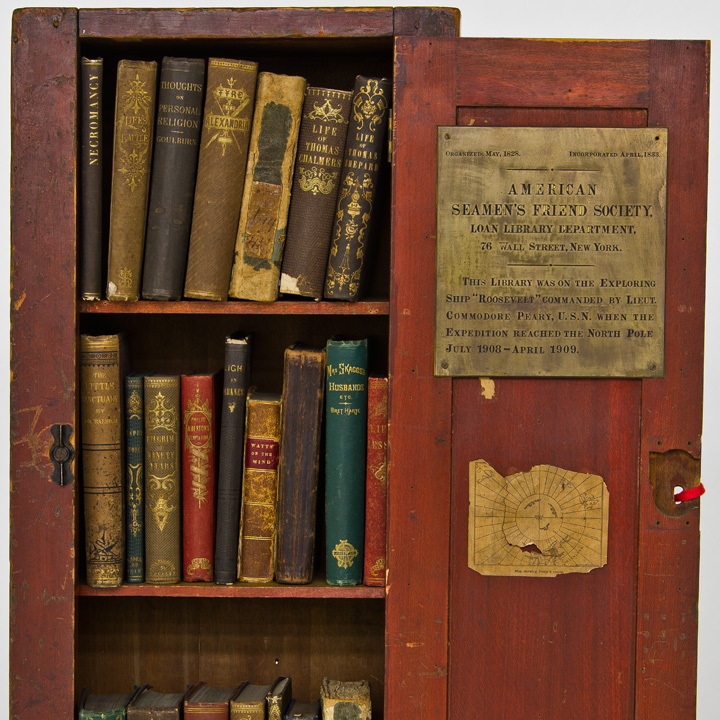 This American Seamen’s Friend Society library went to the North Pole with the Peary expedition 1908-09. The American Seamen’s Friend Society went out of existence in 1986, but its records are held by the Collections Research Center at Mystic Seaport, and this building serves as a testimonial to the good works of the society on behalf of sailors. Often you will find one of the Museum’s roleplayers in this building, ready to talk to you about what it is like to live in an 1870s maritime community. This building was originally a workshop on Clark Greenman’s property and was located where the Treworgy Planetarium is today. It was moved to its present site in 1960.